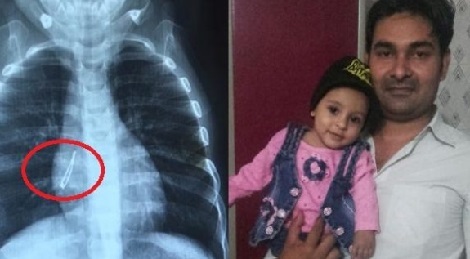 “The parents initially thought that Ariba had swallowed a thread or a small part of a toy. They took her to a local physician who couldn’t diagnose the condition. Her condition deteriorated within a week,” said doctors from the hospital. After being advised by relatives, the family admitted the child to Wadia Hospital. Dr Divya Prabhat, head of ENT department at the hospital, said an X-Ray report revealed that there was an object in the right lung. Ariba was put on antibiotics to prevent and control the infection.